1. Harry Potter - I still maintain that this is one of the most addictive and amazing series written. 2. Hunger Games - It doesn't get more compelling than this. 4. Wizard's First Rule by Terry Goodkind - If you can get past the length, this book is amazing. It has everything you could want in a book. 6. Dear John by Nicholas Sparks - I don't like all of his writing, but this book seemed so very real. 7. The Help by Kathryn Stockett - This book has just the right mixture of good story, humor, and strong message. 8. Crank by Ellen Hopkins - I admit that I haven't read this complete book, but from the bit I have read and other excerpts of her books I know how powerful they can be. 9. Nightshade by Andrea Cremer - I loved this entire trilogy and really think it should be "the next big thing." 10. Anna and the French Kiss by Stephanie Perkins - Who can say no to a romantic comedy? Especially one set in Paris? im so with you on Harry and Twilight!!! i think that those are going to be the top two for almost everyone!!! I chose Harry Potter and The Hunger Games, as well! I for a very brief moment considered Twilight, since it has demonstrated success in this area, but I just couldn't bring myself to actually recommend it. I think the topic needed to add HP just as a given since it's on so many people's lists (mine included!) - and I love the rest of yours! I too have some problems with Nicholas Sparks books, but they are quite accessible, relatable and readable. I'm a little fearful of reading Forbidden since I've seen such differing opinions on the matter; though every review I've seen definitely recommends to read it. I think I'll have to just do it to satisfy my curiosity! You're so right about Twilight. I've gotten so many people who don't typically read, hooked on those books. It's something that my friends and I have bonded over. I'm so sad to see it all end! Harry Potter and Hunger Games are both great picks for non readers! I do agree with your Twilight comment. The many people I have seen who have continued to read after picking that up. I would think an author should be flattered to have that influence and not necessarily that they made the best sellers list!! wow we have a lot of the same picks! Cool. Great choices. I totally agree about Harry Potter and The Hunger Games. 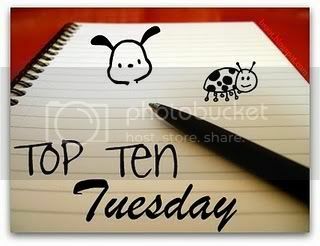 I have THG on my list, and it seems like quite a few of the Top Ten Tuesday posters have one or both on theirs, as well - seems like a good many of us agree that they'd be great! I also have The Help on my list. It was SUCH a good book! Forbidden was a wonderful, powerful story that makes the reader think. Great list!